Concur Labs, the slightly more experimental arm of SAP’s travel booking and expense management service Concur, today announced an integration with Slack that may actually make managing your expenses a bit easier and less annoying. 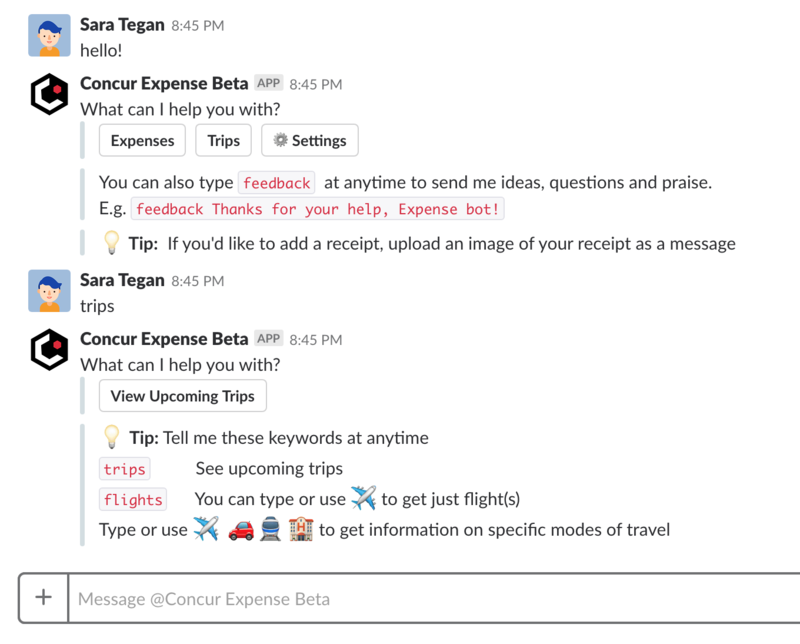 Using the new Concur Slack bot, users will, among other things, be able to submit receipts and enter their basic expenses, while their bosses can use the bot to approve them. John Dietz, Concur’s VP for Labs, told me that the idea behind Labs is to try alternate interfaces for Concur. “Over the last year, most of our investment has been in conversational interfaces,” he noted. The Labs team itself has long been using Slack internally, so adding this integration was something of a no-brainer for the team. After a private beta with a couple of customers, Concur Labs is now ready to roll this service out to a wider audience. There idea here isn’t to provide a full replicate of the regular Concur app. Instead, it’s meant to focus on the most common scenarios. 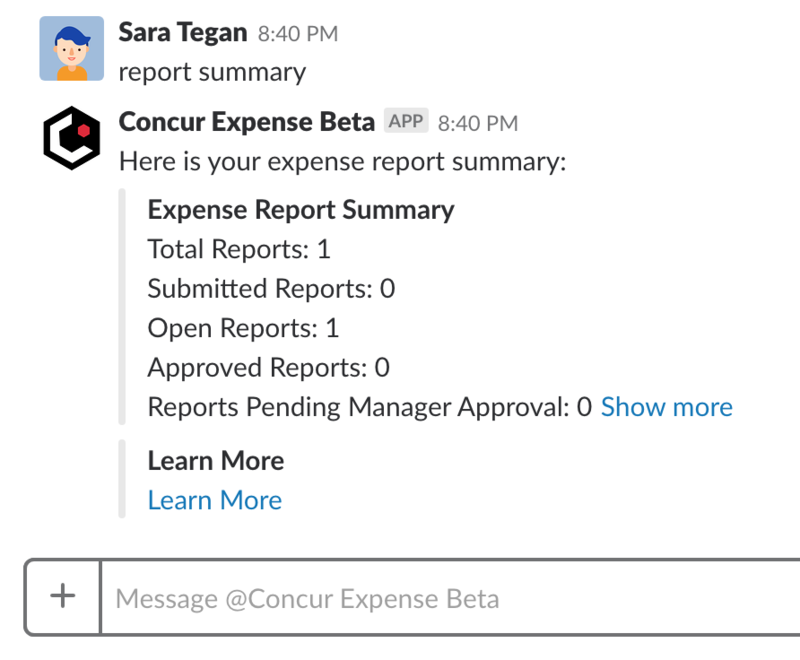 Right now, the @ConcurExpense bot can notify users when they have any expense reports to approve and lets them upload receipt images and even enter basic expenses. That means you can simply write “expense $10 for Starbucks” and the system will automatically add this to your report. The team also plans to launch a travel bot for both travel booking and giving user information about their company’s travel policy. The company is demoing this bot at an event today, but it’s not quite ready for prime time. Travel booking is obviously fairly straightforward, though I’m personally still somewhat skeptical that this is something frequent business fliers will want to use. They tend to have a lot of personal preferences, after all, and the ease of use of the kind of travel matrix Concur already offers is hard to beat. It’s worth noting, though, that SAP also owns Hipmunk, which runs one of the more popular travel booking bots, so there’s hope the Slack integration will work well, too. As for answering questions about travel policies, Dietz noted that this is something that keeps finance departments busy, as employees always tend to ask the same questions (“Can I book first class for this flight to Paris?”) and they tend to give the same answers (“No.”). A bot that can read the PDF documents with these rules that virtually every company uploads to Concur could free up a lot of time for these departments. Given the complexity of some of these tasks, it’s no surprise that the expense bot relies heavily on Slack’s dialog feature to guide users through the workflow. Indeed, Jassim Latif, the director of partnerships at Slack, told me that his team worked closely with Concur Labs to build this integration and learned quite a bit about what users want. A lot of this work actually flowed into improving Slack dialogs. “This has been a highly demanded integration from our shared enterprise customers,” Latif told me and echoed Dietz’ comments about how a chat interface is actually quite useful for handling managerial tasks, even as chatbots in the consumer world are still recovering from their early hype and disillusionment phase.